Our Multicharged vitrified tile is one of the advanced technology for vitrified tiles. This technology is brought on a tiles by using dry body stains (color powders) while the tile is being pressed. Thus veins and designs are found right through the tile’s body. In terms we call it random color feeding system. There are no such confines in colors and patterns for making Multicharged Tiles. We are getting so many enquiries since we broadcast the launching of Multicharged Tiles. Viewers are keen to know why should they pick our Multicharged Tiles and what are the differences between Multicharged Tiles and Soluble Salt Vitrified Tiles? So, here are several advantages of Shreeji Artica’s new product Multicharged Tiles over our elder product Soluble Salt Tiles. •	In Soluble Salt Tiles segment, once the vitrified body being pressed from tile press, Liquid oxides are used to print over green ties where Multicharged Tiles are made of dry powders or colors to bring design before the tile is being pressed in press machines. •	Soluble Salt Tiles are more absorbent due to its printing method but in case of Multicharged Tiles, direct colored powders are used to get non-absorbent surface. •	Most important thing is you cannot expect gigantic design and patterns in S.S. Tiles but Multicharged Tiles can serve you better with roughly unlimited design picks and patterns made with its different kind of manufacturing systems. •	After miniature period S.S. Tiles surface may get dull or scratchy even though with nano+ polished technology whereas Multicharged Tiles stay much brighter and shiny for matchless longer time even with rough use. •	If you are looking for long time use, I must suggest you to select Multicharged Tiles with much better life span. Soluble Salt Tiles have lesser life span as design keeps diminishing. Overall, our Multicharged tiles are our decent offering if you are not worrying about price tag and can create more attraction in compare to Soluble Salt Tiles. 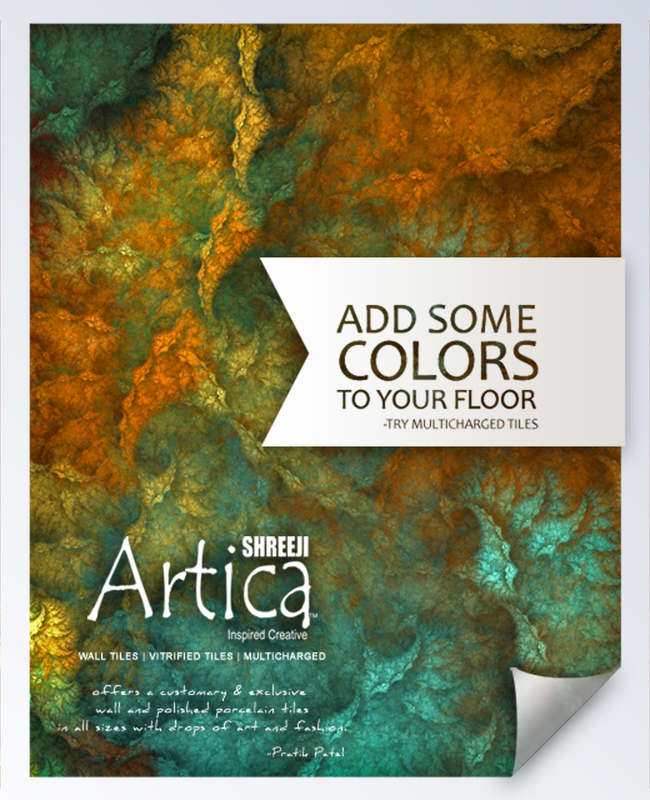 Symbolizing Shreeji Artica’s brand value – “inspired creative”, our tiles are ideal for the Indian floors with attractive patterns, modern look, unrivalled creation and satisfactory value. THINK OF YOUR SEGMENT. ADD SOME COLORS TO YOUR FLOOR. 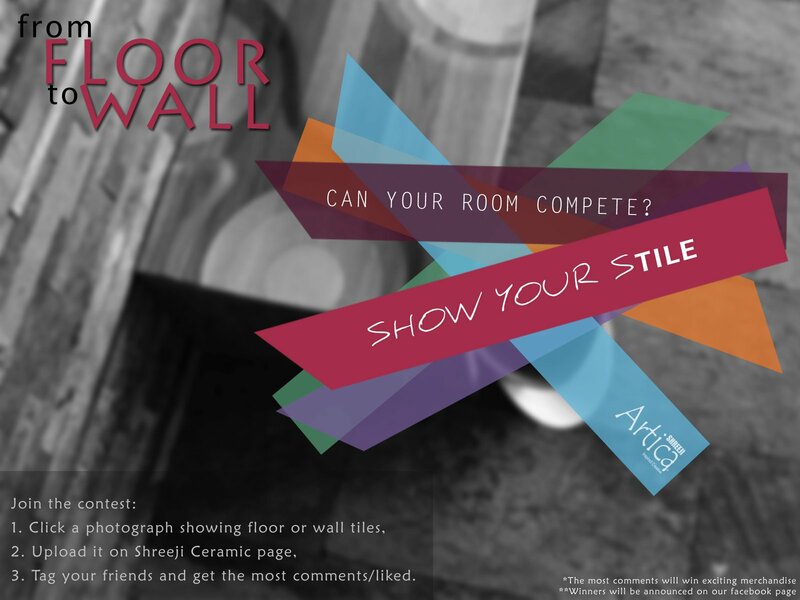 Like us on our facebok official page and join the contest. 3. Tag your friends, invite them and get the most comments/likes.